Provide comfort for the family of Freida Kolm with a meaningful gesture of sympathy. 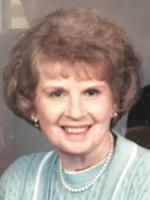 Freida Aileen Kolm, 87, of Blue Springs, MO, passed away on Saturday, March 30, 2019. Visitation will be from 8:30-10:00am on Saturday, April 6, 2019 with a service at 10am, both at Timothy Lutheran Church in Blue Springs, MO. There is a luncheon to follow at the church, and a burial service will take place at 4pm at the Stover Cemetery in Stover, MO. Memorials are suggested to Timothy Lutheran Church. Born to Pearl and Elmer Mathes in Decatur County, Iowa, August 14, 1931, Freida lived her first 9 years in Eagleville, Missouri with older sisters Dorothy and Louise and younger brother James. The family then moved to Des Moines, Iowa where Freida graduated from East High School in 1949. She followed her sister Dorothy to St. Luke’s Nursing School in Kansas City, MO. Freida met Walter Moore of Wellsville, Kansas at a nursing dance. They married in 1951 as he was being drafted into the United States Army during the Korean War. When Walter returned from overseas service, they moved to Kansas where he partnered with his father in the oil drilling business. Freida and Walter had 2 daughters, Diane Elizabeth, born in 1952, and Janet Louise, born in 1955. In September 1961 they were called back to Des Moines, Iowa as Freida’s older sister, Louise was dying. On their return to Kansas they were hit by a semi-truck, and Walter and six-year old daughter, Janet, were killed on September 24, 1961. Freida then worked in several medical clinics and a dentist office until she met widower Roland Kolm in Kansas City. They married in 1965, forming a new family with Roland’s sons Roger and Dale, and Freida’s daughter, Diane. Freida served as church secretary for Abiding Savior Lutheran Church in Independence, MO for 7 years, but the career she loved most was selling real estate for 25 years in the Kansas City area. She really loved people! Her husband, Roland Kolm was a builder contractor, and she claimed they worked well together. After retiring, Freida and Roland bought a home in Mesa, Arizona, where they wintered with new and old friends for 23 years. Freida and Roland were active members at Timothy Lutheran Church in Blue Springs, MO. They were faithful in Bible study groups. After 49 years of marriage, Roland Kolm passed away in 2014. Concerning her husbands, Freida said, “I chose well, twice.” Walter and Roland were somewhat quiet, but she said Roland was funnier, having taken that trait from his mother, Martha Kolm. Freida is survived by daughter, Diane Ringen and husband, Dean; son Roger Kolm and wife, Leticia; son Dale Kolm and wife Connie; 6 grandchildren, Chris Kotowicz, Scott Kotowicz, Christine Kolm, Daniel Kolm, Rachel Kolm, and Zachary Kolm; 5 great grandchildren; and many friends. To send flowers in memory of Freida Aileen Kolm (Mathes), please visit our Heartfelt Sympathies Store. Consider providing a gift of comfort for the family of Freida Kolm by sending flowers. We encourage you to share your most beloved memories of Freida here, so that the family and other loved ones can always see it. You can upload cherished photographs, or share your favorite stories, and can even comment on those shared by others. Provide comfort for the family of Freida Aileen Kolm (Mathes) by sending flowers. We cherish many wonderful memories with Freida. She was a good friend and will be missed. We send our sympathy to her family.